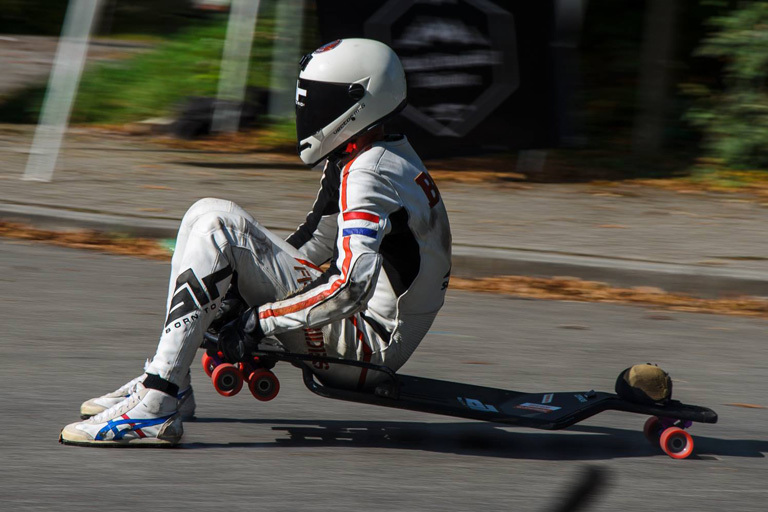 The last week of October was the start for my first luge training in Austria. Together with, now team mate, Dirk Jongkind we drove from Amsterdam to Vill in Austria (2 km below Innsbruck). Here we met up with the rest of the group, 2 Romanian coaches (both former Olympic athletes), 4 Romanian luge riders, 2 Bulgarian Olympic riders (all 6 participated in the 2014 Sochi Olympics) an Aussie and an Argentinian rider. Together with us 2 this made our crew for the first week. Monday was our first day but the coaches kind of forgot to order gear for me, so the first day I didn’t ride but I mostly looked at the others, what they did and so. Day 2 was the day where it began for real for me. I got my sled, which I named Grace (after the iconic and stylish Miss Jones), I got a skin tight suit, a helmet and a pair of very uncomfortable luge shoes. I was ready to go. I started from the ‘Kinderstart’, which is the start where the kids first start. It’s positioned between corner 7 and 8 and has no ramp so you start slowly. I was facing 6 corners/curves in my first run and I was hella nervous. I took of and made my way down the first 2 curves. Coming out of the second one, I started playing ping pong with the walls bouncing back and forth but I managed to stay on the sled. Corners 11, 12 and 13 are fast which launched me into 14, the last one. Coming out of it I was way too high so I hit the wall hard and flipped the luge upside down, see it here. I scraped across the ice, on one hand glad I had a crash so I got that out of the way quickly, on the other hand disappointed since I was hoping for a clean first run, since I had a GoPro on my helmet to record my first run ever. But I was stoked. I couldn’t wait to go again, despite a sore knee. I did more runs and slowly I got the feel of the sled and after 2 days at the kiddy start I moved up to the junior start, which is just below the ladies ramp. I got the hang of it more and more and after a day and a half I went up the ramp for the first time. Watching my own movies in slow-mo I see I still have a street luge form which I need to lose to take the proper lines, but all in due time. The first week is now over and we are now on our way to Sigulda in Latvia, a 2200 km ride, which we will do without spending a night somewhere. It will be rough and I can’t wait to crash in a bed afterwards. This week can be summarized in just one four letter word; EPIC. Can’t wait for Sigulda which is next level. Some fierce G-forces are awaiting me there in the penultimate corner. Check out some pictures of this week here.